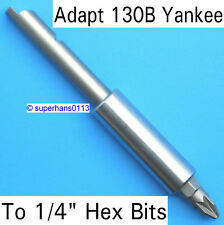 Yankee screwdriver Nr 130B. Weight 407 gms. Length open 43 cm. Beautiful 4" Multi - Tool w/ 1/8" Turnscrew 12538 Beautiful 4" Multi - Tool w/ 1/8" Turnscrew 12538. Coopers Jigger Shave Tool Drawknife 3" Blade VT7022. Fine Early 14" Screw Stem Marking Gauge with Lock Nut VT2629. Vintage Stanley Screwdriver Set Blue. Condition is Used. Dispatched with Royal Mail 2nd Class. Stanley Vintage Screwdriver Set Red. Condition is Used. Dispatched with Royal Mail 2nd Class. 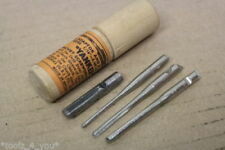 3 vintage perfect pattern screwdrivers; 2 x 6", 1 x 10"
4 Vintage Turnscrews/Screwdrivers. Sizes are 10 inches - 12 inches. In solid condition. 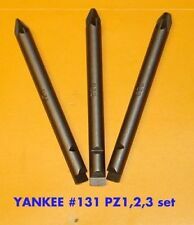 Stanley 'Yankee' scredrivers x 2. Condition is Used. Dispatched with Royal Mail 2nd Class. Vintage Tool Clutch handle Turnscrew screwdriver 41/2 Inches long Gunsmiths. Condition is Used. Dispatched with Royal Mail 2nd Class. 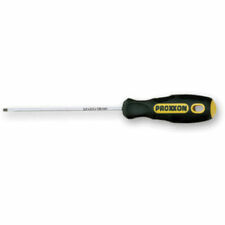 Pick up procedure is as follows Fine Early 14" Screw Stem Marking Gauge with Lock Nut VT2629. PICK UP OPTION. Collection in Person -£0.00. Coopers Jigger Shave Tool Drawknife 3" Blade VT7022. You might also like. 5 VINTAGE ENGLISH WOODEN HANDLE CABINET MAKERS SCREWDRIVERS BY SORBY, GOVENOR. Stanley "Yankee" 233H Vintage, Ratchet Screwdriver. 10" overall length. Handle cap has been repaired but works fine. A few light scratches in plastic handle handle. 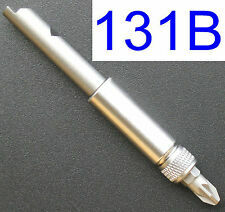 This is a YANKEE style screwdriver made by TALCO of Japan. Weight 780 gm. Length open 62 cm. Wooden Handle Multi-Tool / Pin Vice Screwdriver - Vintage. This listing is for the handle only, no parts to put in the end. Wooden handle is possibly oak but I'm not 100% sure. Length from base of handle to end of metal is 9.5 cm (3 and 3/4 inches). Came across it in garage clear out. It is in great used condition, just a few marks marks on the wooden handle and metal (see photos). 3 VINTAGE ENGLISH WOODEN HANDLE "TURNSCREWS" SCREWDRIVERS BY WATSON, WOLSELEY. Large Vintage Stevenson sheffield wooden handle flathead screwdriver. Condition is Used. 16inch total length. A quality tool in nice condition. As always the pictures form part of the description. Will be packaged and sent with care. 2 vintage Perfect screwdrivers 6" and 10"
Minor use marks on handle. A Fine Marples 10 1/2" Cabinet Pattern Turnscrew 3/8" Blade 12306 A Fine Marples 10 1/2" Cabinet Pattern Turnscrew 3/8" Blade 12306. Fine Early 14" Screw Stem Marking Gauge with Lock Nut VT2629. Coopers Jigger Shave Tool Drawknife 3" Blade VT7022. 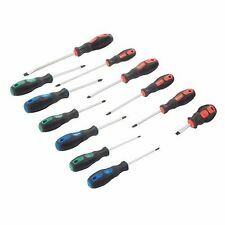 New listingA nice selection of Stanley Screwdrivers, ranging from 12" - 3.5" in length . A nice selection of Stanley Screwdrivers, ranging from 12" - 3.5" in length i nclusive. Red & blue. Stanley 5000 series. (8- in all.). Overall in lovely condition and are ready to be used or would make great additions to a collection. HOUSEHOLD, TOOLS, MARPLES CARPENTERS WOODWORKING VICE. Here we have a sellection of six vintage wooden handle screwdrivers of different makes and sizes all in good used condition . Thanks for looking. Cabinetmakers Screwdriver Slotted Turnscrew Wooden Octagonal Handled 6 1/4"
Lovely useable screwdriver. 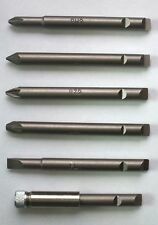 Slotted straight tip 5/16" wide. 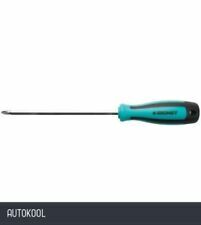 Stanley Yankee 130A Ratchet Screwdriver. Condition is Used. Dispatched with Royal Mail 2nd Class. 11" Boxwood Handled Screwdriver with 5/16" Blade by Marples 14176 11" Boxwood Handled Screwdriver with 5/16" Blade by Marples 14176. Coopers Jigger Shave Tool Drawknife 3" Blade VT7022. PICK UP OPTION. VINTAGE - CABINET MAKERS GUNSMITHS SCREWDRIVER TURNSCREW. VINTAGE -BRADES COMPANY SCREWDRIVER 14" LONG. Antique 11” Flathead Screwdriver w/ Wood Handle - VERY RARE! !